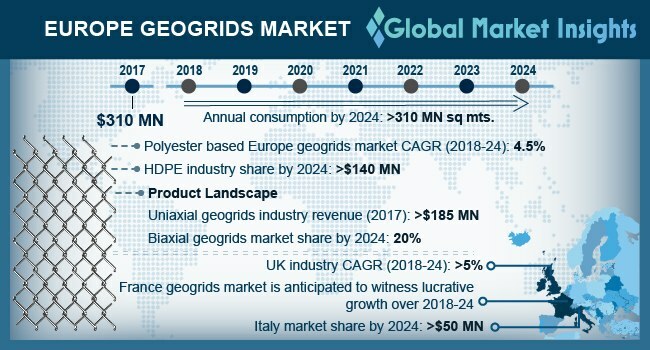 Europe Geogrids Market size is set to surpass USD 460 million by 2024; according to a new research report by Global Market Insights, Inc. Rising infrastructure spending accompanied with increasing number of construction projects in Poland, Russia, UK, Germany, and France should drive Europe geogrids market demand. They impart high tension membrane effect, improve bearing capacity of aggregate layer, and restrain lateral movements thereby positively influencing industry growth. Growing application in railways, increase performance and structural integrity while reducing costs which in turn fuel product demand. These are mainly cut and installed over excavated soil for enhancing subgrade strength, reducing thickness of base layer and imparting flexibility. Rising cost requirements for road improvement along with increasing government expenditure will foster the Europe geogrids industry growth. Polypropylene based geogrids market demand accounted for over 19% of the overall market share in 2017. Improving regulations regarding road construction in Russia, rising erosion-damage, and increasing airport related projects may drive product demand. The superior stiffness, aperture stability, structural reinforcement, and strong interlock capabilities are the major characteristics which are likely to stimulate Europe geogrids market growth. Spain uniaxial geogrids market size may expect consumption at over 10 million sq. meters in the projected timeframe. These are highly used in applications requiring high long-term loads to be mobilized. Booming construction industry, economic recovery, and increasing demand for residential housing are likely to boost the infrastructure sector, thus stimulating regional market growth. They are commonly used for reinforcement and construction works and are highly exposed to varying stresses such as installation stress, angularity and low temperatures. Also, are often used to minimize reflective cracking spread in parking lots, runways and aprons. However, reduced product strength owing to installation and creep damage will be a major challenge and may pose high threat for the Europe geogrids industry growth. Denmark geogrids market demand from railroad may witness growth of about 2.5% by 2024. The ratification of several transport agreements including heavy investments surpassing USD 15 billion may stimulate the infrastructure sector by 2020. Additionally, the recovery in real estate market and archaeological damage from coastal erosion in Northern Jutland may further accelerate regional product demand. Norway multiaxial geogrids industry is expected to surpass USD 2 million over the foreseeable timeline. Multiaxial products primarily include triaxial and quaxial, which are commonly used in highly-trafficked roadways, flexible pavements, parking lots, slope construction and erosion-control applications which may further accelerate market demand. These products exhibit multi-directional strength, high stability, superior performance and allows easy installation which may further accelerate regional market growth. Solmax GSE, Tensar International, TENAX and Ten Cate are some of the prominent industry participants in the Europe geogrids market. Companies are expanding their regional reach by entering into agreements to expand their distribution network along with investing heavily in R&D activities to develop new products and expand their product portfolio.